This section provides links to guitar articles offering in depth advice on various aspects of learning guitar. 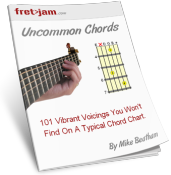 From frequently asked questions such as "do I need to learn guitar scales?" to crucial tips on overcoming common problems and how to manage your practice time more efficiently... call it bed time reading if you like! Remember, if at any point you need personal advice on learning guitar, visit the questions section for in depth answers and suggestions. ❱ Is Learning Guitar Hard? Advice for beginners who are wondering if they're cut out for playing guitar. This article provides some important and mildly humorous perspective (a philosophy... at a push) on the roller coaster ride that is learning guitar. ❱ What is the Best Way to Learn Guitar? Discusses the different ways you can learn, weighing up the pros and cons of private lessons, free websites (including YouTube) and paid subscription websites. Find out what the best way is for you. See also: Best Online Guitar Lessons if you choose the online method. ❱ Is Guitar Theory Important? How guitar theory can help you become a better player, especially if you want to improvise and write your own music. However, the article also discusses an important quality, the lack of which no amount of theory will make up for. ❱ Why Should I Learn Intervals? Most guitarists learn the notes (A-G) on the neck, but few understand the benefits of learning intervals. This article explains how knowing intervals can save you time and help you see the fretboard in new ways. General Advice and Learning Guitar "How To's"
❱ Beginner Guitar Tips advice for the beginner guitarist on planning your practice sessions, overcoming frustrations and developing the appropriate mindset for learning guitar. ❱ 4 Bad Habits to Unlearn short and sweet. Make sure you can check these bad habits off your list to save yourself from a lot of unnecessary frustrations later on! ❱ 10 Guitar Playing Rules Ten rules you should never break as a guitarist, to keep you on the straight and narrow while maximising creativity. ❱ How to Read Guitar Tab Being able to read tab has a number of benefits. It allows you to learn existing songs and transcribe your own. Plus, it's much easier to learn/read than standard notation! ❱ The Right Guitar Playing Style For You ...is not what you think! Read this article before you choose which style of music to learn and ensure you reach your fullest potential as a musician. ❱ Best Finger Stretching Exercises Stretching for five minutes before you play helps to loosen those fingers for optimum playability. Don't limit your ability unnecessarily by neglecting these quick and simple exercises! ❱ 10 Reasons Why You're Not Making Progress on Guitar Exactly what the title says! If you've hit a roadblock in your learning, this article will provide you with a checklist of possible causes so you can start moving forward again. ❱ How to Have a Successful Practice Every Time Learn the fundamental principles that make each practice session count and help you stay motivated. ❱ Finding Time to Practice If you have work and family commitments, time with your guitar is likely scarce. This article offers some practical tips on making the most of your practice time, making time for practice and dispels a myth about what constitutes "enough" practice. ❱ Guitar Practice Schedule Finding a practice schedule is one thing, but finding one that's right for you personally requires more thought and goal setting. This article will save you a lot of wasted time and frustration. ❱ How To Use a Metronome The foundations of productive metronome use, both for developing expert timing and fast playing speeds. Get the most from your metronome. ❱ 10 Tips for Playing Guitar Fast Avoid the frustration so many players unnecessarily put themselves through by ensuring you apply these 10 practical speed building tips. ❱ Making the Most of Noodling on Guitar Noodling is about practicing the "art of randomness", a crucial skill for improvising and developing ideas. Make sure you get the most out of every second the guitar is in your hands. ❱ How to Learn Solos by Ear Don't rely solely on tab to learn songs. In this article I show you how to use a free piece of software to help you learn any solo/song by ear - a powerful skill that will help you in many areas of guitar playing. ❱ How to Learn Guitar Licks Provides you with a 10 point check list to ensure you're learning licks in the most productive way possible. ❱ How to Improvise on Guitar Discover what it takes to improvise like the greats and come up with great ideas "on the spot". An in depth article that offers practical advice on nurturing your improvisation skills. Not for beginners! ❱ Developing Your Inner Ear The inner ear is your ability to memorise, recall and create music on the fly, before you even touch your instrument. Learn how to access and unlock this powerful part of the mind. ❱ How to Determine Key by Ear Stop relying on charts to tell you about key - they're not 100% reliable and sometimes you don't know the chords to a piece. This lesson will show you how to use your ears to work out the key.